Simple Cleansing Facial Wipes | £3.25 // I didn't use these face wipes on my face and instead used them when swatching make-up. 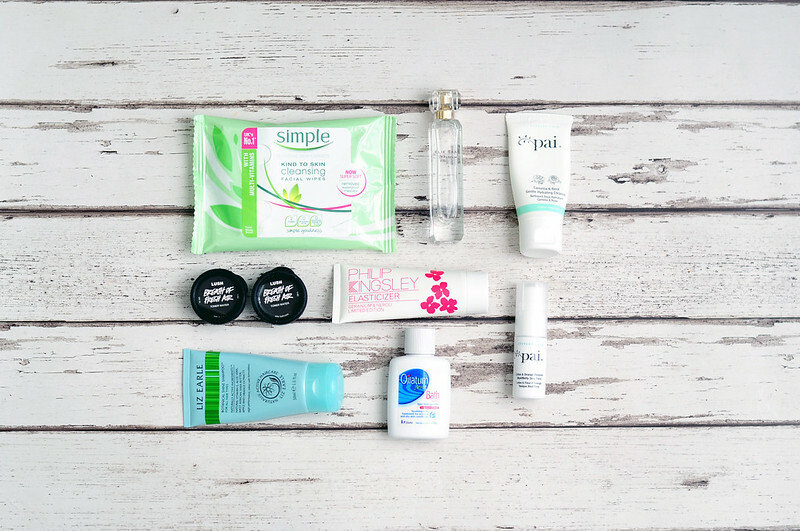 I find face wipes irritate my sensitive skin so even though I always have a pack in my dressing table drawer, they're always for clean ups and I usually just pick up the brand that is on offer. Elie Saab Le Parfum | £58 // This mini bottle of Le Parfum came in a gift set along with the full size which I finished quite a while ago now. I was trying to make this bottle last as long as I could as I've put myself on a no buy when it comes to perfume until I've used up what I have. I spent a good couple of weeks smelling of Le Parfum again and I loved it and I can see myself buying another bottle at some point. Pai Camellia & Rose Gentle Hydrating Cleanser | £28 // I prefer a balm cleanser although I did enjoy using this cleanser. The travel size was a really good way to try it out before buying the full size. It was also perfect to take on holiday which I did twice. Lush Breath Of Fresh Air Toner Water | £8.50 // I love the samples from Lush and how I can try products out before buying the full sizes. These little black tubs contained a cotton pad soaked in the toner which I thought was a really great way of sending a liquid product out. While I don't think I'd buy the full size toner, it was nice to try it out. Philip Kingsley Elasticizer | £29 // I seem to have built up quite a collection of these mini tubes of elasticizer thanks to various beauty boxes. This is my all time favourite hair mask and despite trying a lot of different products, I haven’t found anything better. Spending that little bit more money really does make a difference with this product. You apply it to damp hair before washing, I tend to combine it with the PK scalp mask, and my hair is left incredibly soft and less frizzy. This is an essential for me and I’ll always have a tube of this in my collection. Liz Earle Botanical Shine Shampoo | £10 // I had a good couple of weeks when I was using this and the eczema on my scalp didn't seem to flare up. I have no idea if this was a simple coincidence or it was down to the shampoo. It does make me want to run out and buy a bottle though! I've both the shampoo and conditioner in the past and really liked them so I think they're next on my list to buy. Oilatum Junior Bath Additive | £9.19 // I have a million of these mini bottles of bath additive thanks to my friend who works in dermatology. They are the perfect size to take traveling as I always want to be able to take something with me to soothe my eczema if it flares up. I don't mind using the junior version as normally it's the only one in stock in Boots when I go to buy it. Pai Lotus & Orange Blossom BioAffinity Tonic | £30 // I really liked this toner although the spray on this mini version wasn't very fine. I'm hoping the full size bottle will be better!